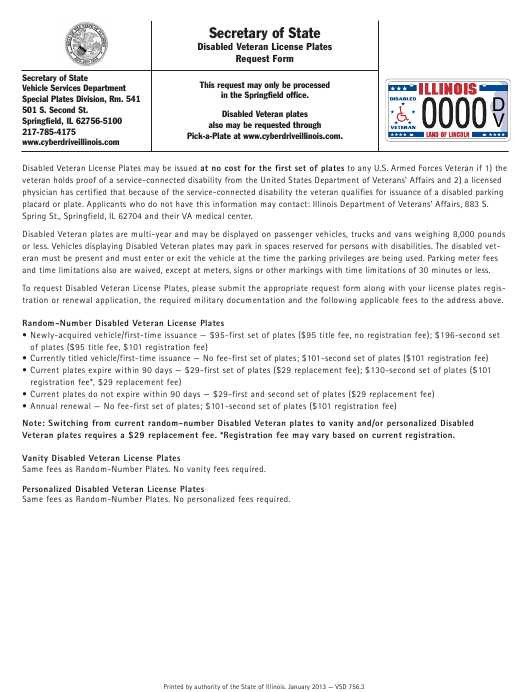 This "Disabled Veteran License Plates Request Form" is a Illinois-specific form released by the Illinois Secretary of State on January 1, 2013. Download the form by clicking the link below, fill it out by hand, and mail it as per the guidelines provided by the department or the applicable legal instructions. placard or plate. Applicants who do not have this information may contact: Illinois Department of Veterans’ Affairs, 883 S.
Spring St., Springfield, IL 62704 and their VA medical center. and time limitations also are waived, except at meters, signs or other markings with time limitations of 30 minutes or less. tration or renewal application, the required military documentation and the following applicable fees to the address above. Veteran plates requires a $29 replacement fee. *Registration fee may vary based on current registration. Same fees as Random-Number Plates. No vanity fees required. Same fees as Random-Number Plates. No personalized fees required. If your exact 1st, 2nd and 3rd choices are not available, would you like the next plate number available in that series? If you want a space between letters, please indicate with a slash mark. An automatic space is required between letters and numbers. Note: 4-letter Disabled Veteran plates cannot have a space. Spacing will vary with the type of plate requested. Proper completion of this form is the customer’s responsibility. • The Secretary of State’s office is authorized to recall a plate determined to be obscene or offensive. available number if your exact request is unavailable. • If you wish to submit more than three requests, attach additional selections to the request form. • Money must accompany request forms on all first-time registrations. • A leased vehicle is eligible for vanity or personalized plates.